First off forgive me if this post is a little rambling. I’ve finally succumbed to the cold both my kids have had over the past week or so and am struggling to stay awake for a late night meeting at work. 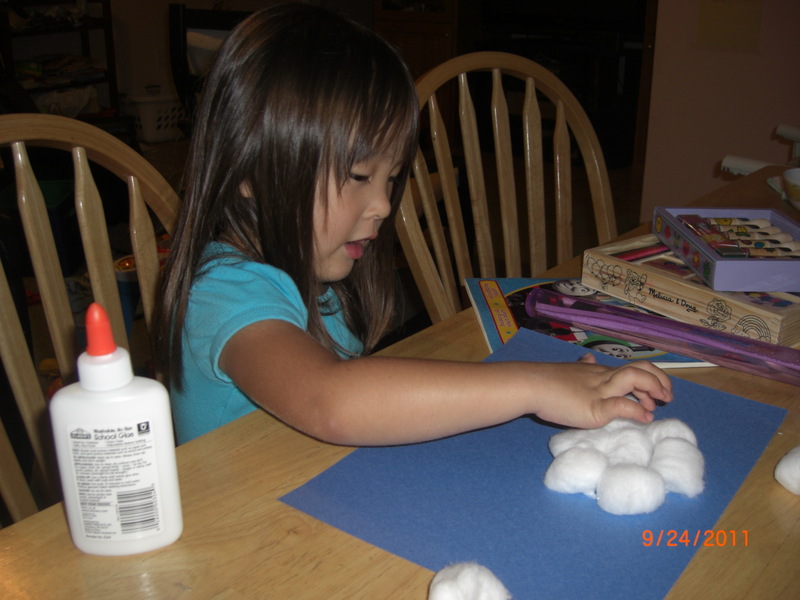 Due to my head pounding and my ears aching I never got to prep another activity for Kaitlyn. 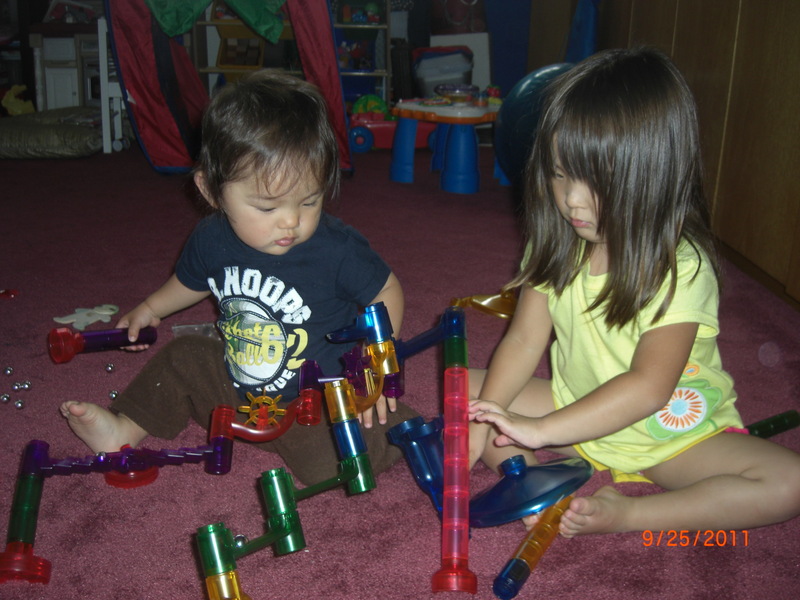 Fortunately I had picked up this marble run kit at Lakeshore Learning over the weekend. If you haven’t been to this store before you should definitely check to see if there is a location near you. It was amazing! I could have roamed around the store for hours if it weren’t for having Kaitlyn with me and deciding she needed just about everything they sold there. This kit required some assembly on my part but once it was put together both Kaitlyn and surprisingly Michael had a blast. It kept them amused while I could just lie back and watch although I had to step in now and then when Michael went on a destruction streak. One other neat thing about this see through kit vs the solid one they also sell is that we got to play around with colors. 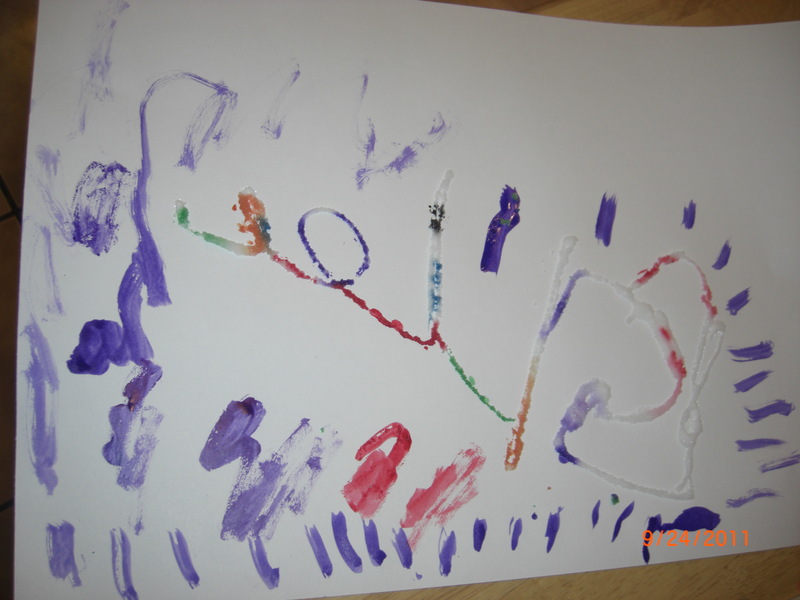 Kaitlyn would put two different colors together and you could see how the two colors mixed to create a third color. So that kept her amused for awhile as well. 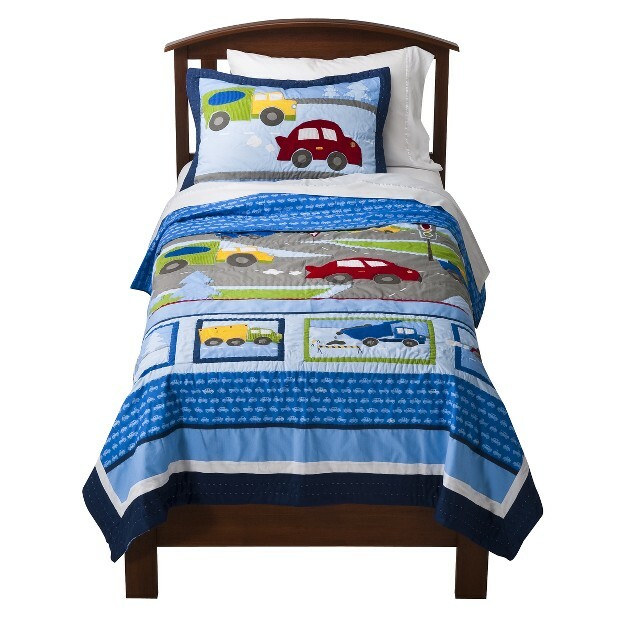 This is definitely a keeper for when you need to keep the kids occupied indoors on a rainy day or a sick day! Yesterday after running me in circles taking “galloping” lessons and learning to hop like a frog Kaitlyn decided she wanted to lay on the ground and look at the clouds. 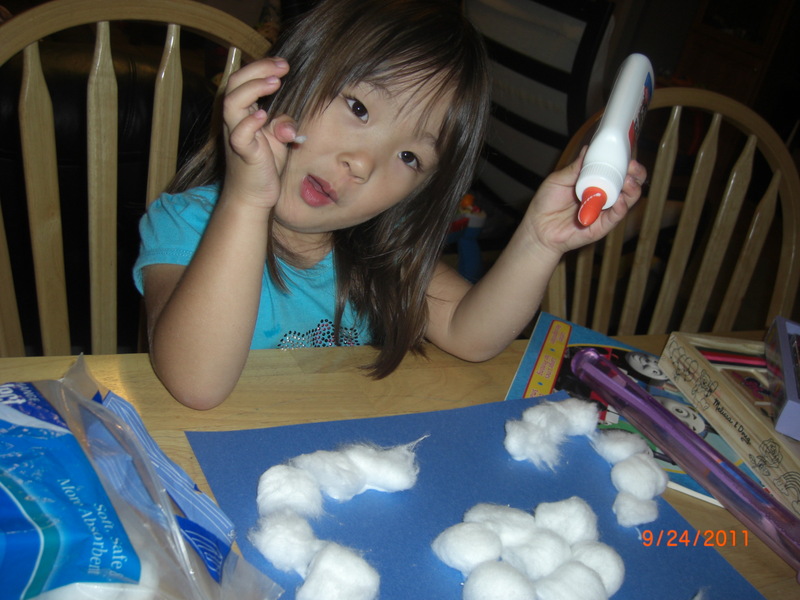 That night we decided to re-create the shapes she saw during cloud watching using cotton balls. 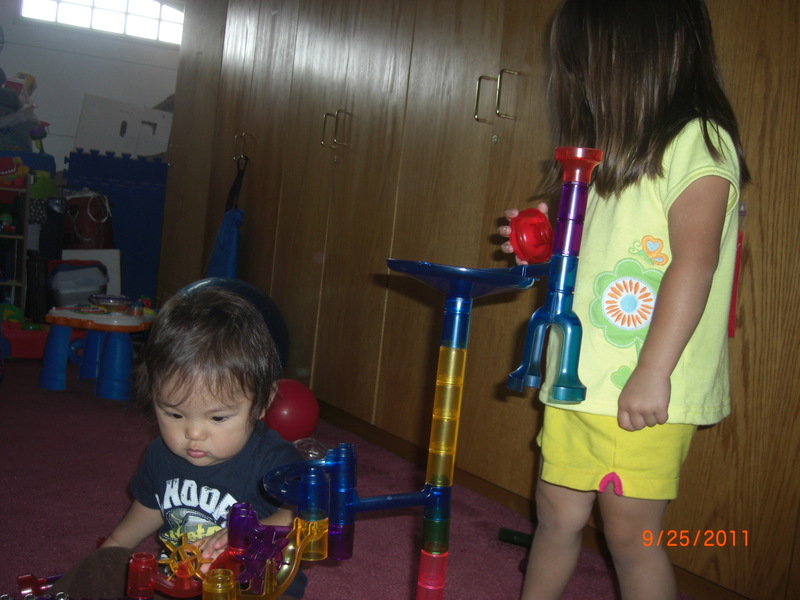 It was amazing how long these kept her occupied. They rode around on her stuffed turtle, flied away from the evil teddy bear and hid out in the tent cave. 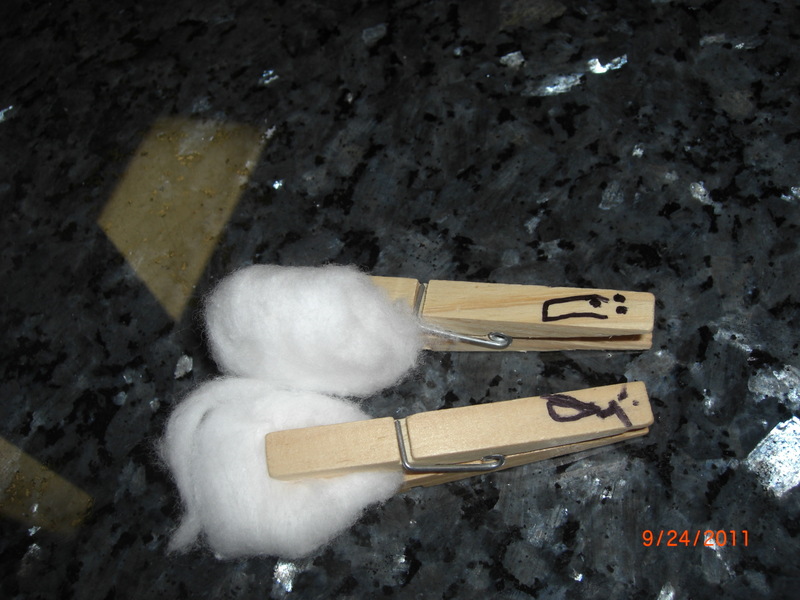 Never underestimate a child’s imagination and every day household products. I took my family up to Travis AFB today. 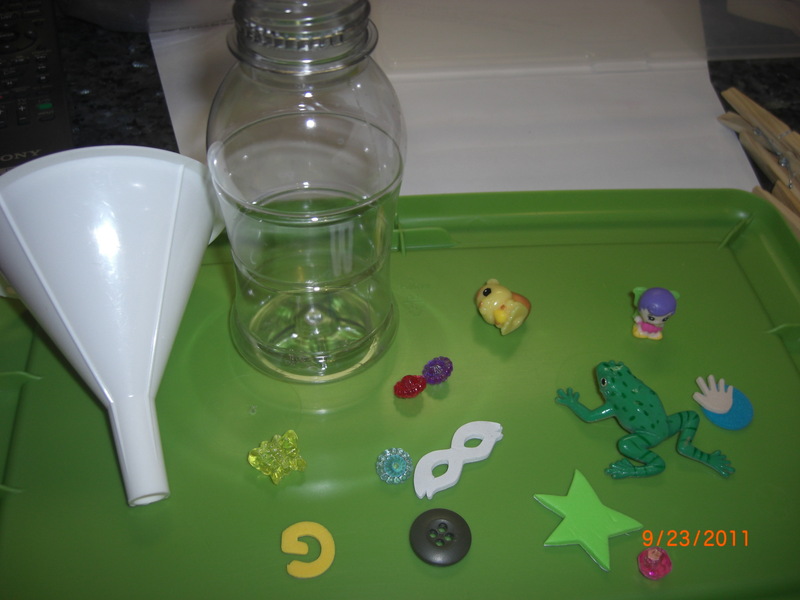 It is quite the drive so I decided to make my daughter an I Spy bottle to hopefully help keep her occupied. I used a cleaned up Nesquik bottle (have I mentioned how I love these bottles? They’re great for projects. 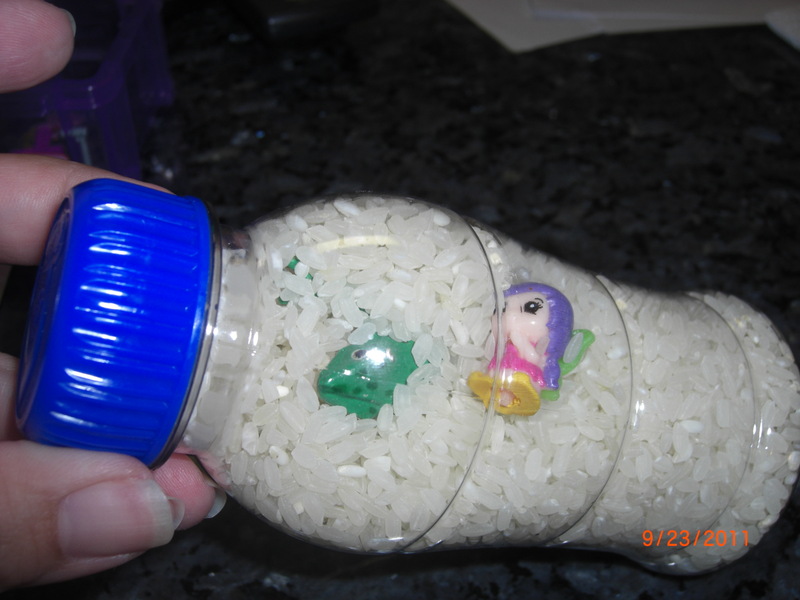 ), rice and whatever knick knacks I found in the playroom. Unfortunately this one didn’t go off as planned. It kept her occupied for about 10 minutes looking for stuff and then another 5 using it as a maracas and then she was done with it. Ah well. That’s when the DVD player in the car comes in handy. 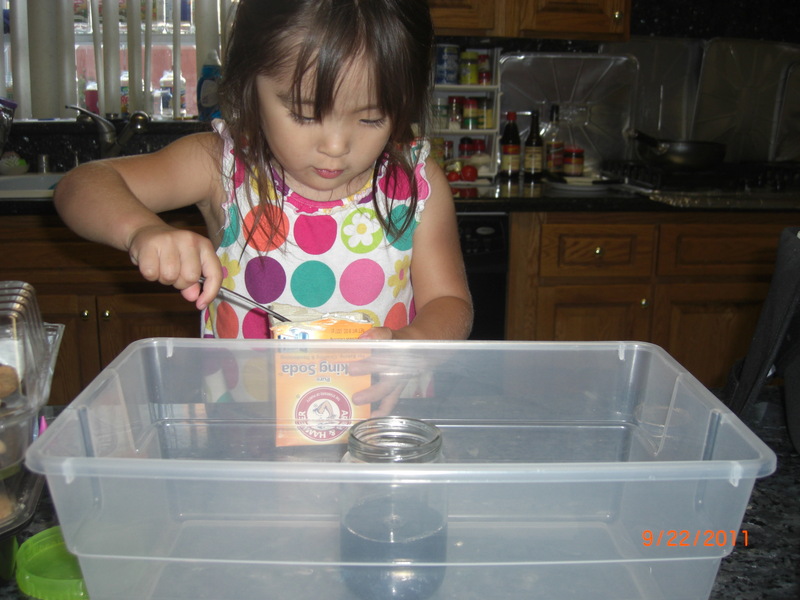 Later that night she begged to do another experiment. I’ve been running out of ideas so went on a craft hunt on Pinterest last night. I came across salt painting and it sounded simple enough and didn’t require anything we didn’t already have. 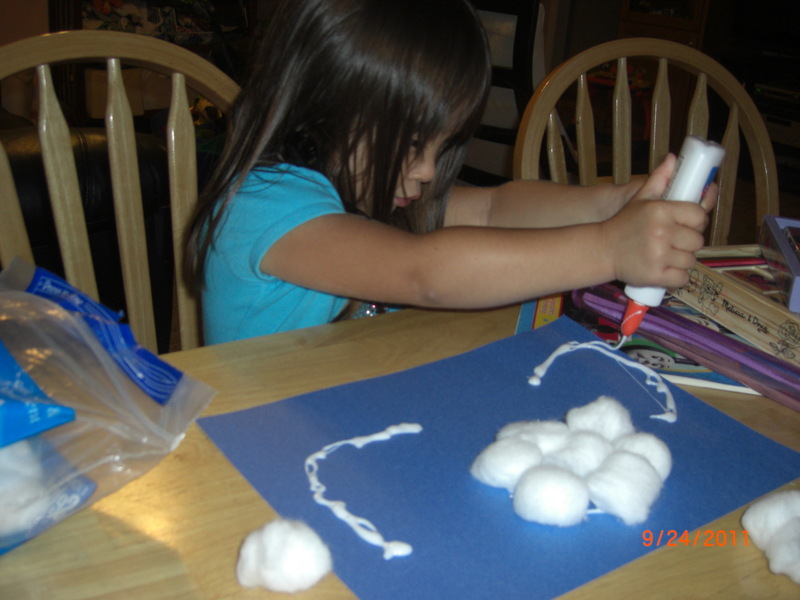 She made her design using Elmer’s glue and then poured salt over the glue. 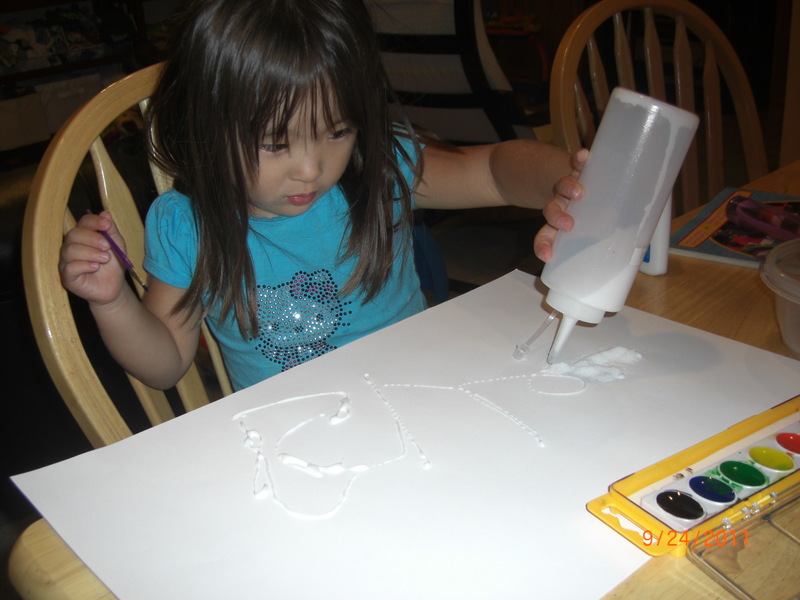 Then take some water color paint and gently touch the brush to the salt. The color will spread across the salt all by itself. The original post I found used liquid paint and it seemed to work much better. 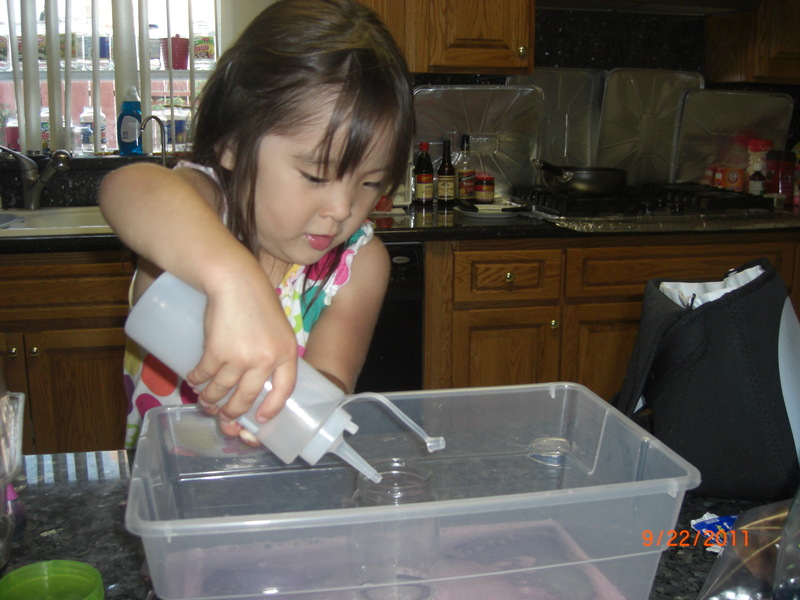 Kaitlyn had to use a lot of water and make sure her brush was pretty saturated to get a good spread. 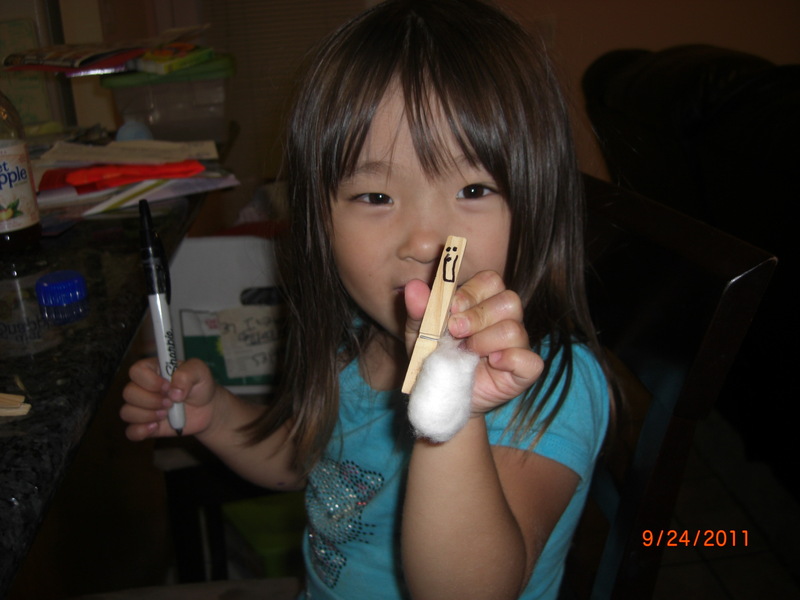 Then as anything involving paint usually does it devolved into painting her fingers and doing finger painting. Here’s her finished product. It was fun but probably not a project we will do again. Maybe will try it again when she’s older. My daughter got this book as a birthday gift from the fabulous Pam from Bookalicio.us. It’s about a sweet, little old lady named Mrs. Collywobbles who lives at the edge of a big, dark forest with just her pet frog to protect her. He defends her against the smelly troll, the greedy goblin and the hungry ogre. My daughter tends to be pretty timid so I wasn’t sure how the book would go over with her but I thought I would give it a try anyway. Much to my surprise she loved it! 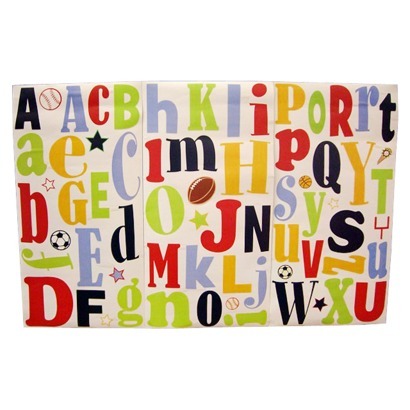 We read it over and over and it even got dragged along into the car for the ride to school. She was laughing and laughing for the whole ride as she “read” the book out loud after having memorized it. She did have a few questions at the end that I was a bit stumped on how to answer but this is still a great book that she asks for every night. She’s even kept it in a safe place under her pillow a few nights just to make sure she would know where to find it the next night. So I had to report for Jury Duty selection today which sucked because it meant I missed my daughter’s picture taking day at school. 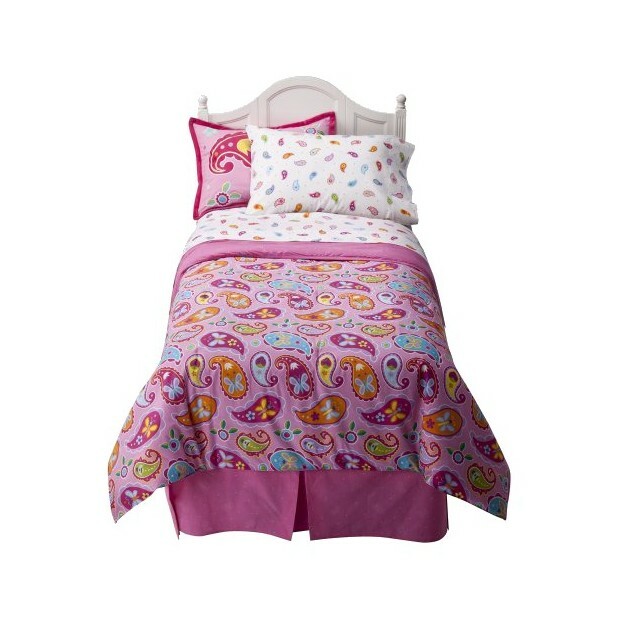 On the plus side though during the lunch break I went over to Target and the bedding I’ve been eyeing for my daughter finally went 75% off. The only problem was there were so many cute options I couldn’t decide on which one to get. So I went and bought all the ones I liked and let Kaitlyn picked the 2 she liked and my mom ending up wanting one for herself and one for my niece. I also picked one up for a friend so it all worked out in the end. 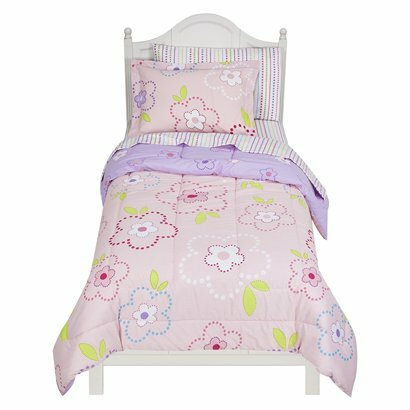 I highly suggest you go check it out if you need some children’s bedding. Here are the ones I picked up. I’ll be returning a few tomorrow but still wanted to show them since they were so cute. 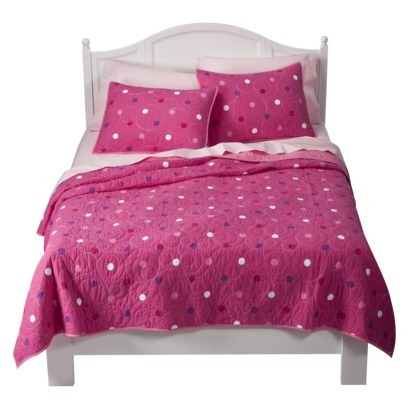 There were several other bedding sets and sheets on clearance too. So you should check out your own store’s selection. 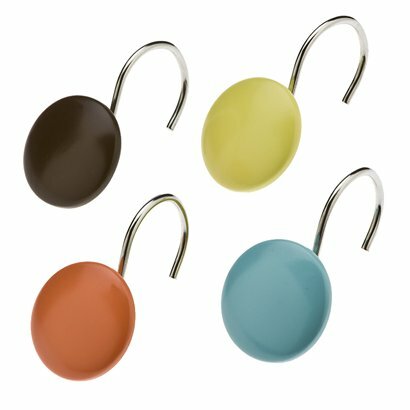 I can’t find the exact one I got for my friend on the Target site but it looked something like this and was only $8.74. This one was also $16.24. I thought it was adorable! 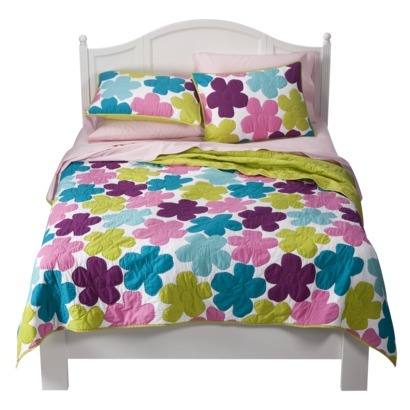 This one was a 7 piece set so a little pricier at $17.48 but it wasn’t one of the ones Kaitlyn wanted to keep so back it goes. 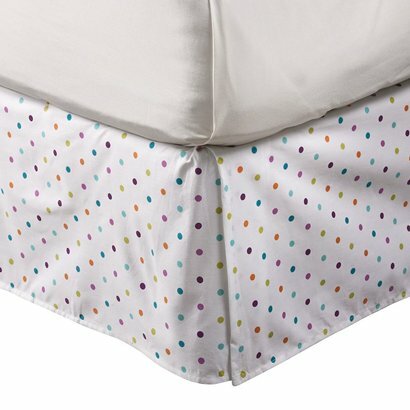 I’ll be returning this bedskirt that was $4.74 since she didn’t pick the comforter that it went with. 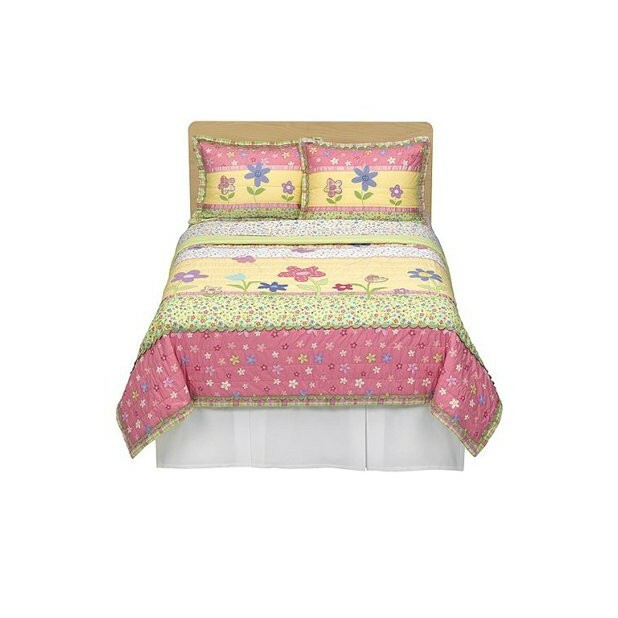 I can’t find the other 2 comforters but they were only $11.24 but I will be returning one and the other one my mom kept. 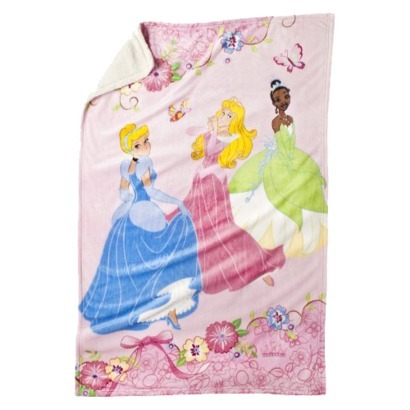 I’ll also be returning this Disney Princess Fur Blanket that was $3.74. So what’s new in today’s Pinterest experiment? Magic potions! What could be better than that for kids? All it required was a clear cup/jar filled half way with vinegar. A dash of liquid dish detergent (which I actually had to go on Twitter to figure out this ingredient because it was listed on the Minieco site as washing up liquid. I was confused if that was hand soap, dish soap, body wash, etc. Thank goodness for Twitter.) but I digress, a few drops of food coloring and a heaping spoonful of baking soda. Then prepare to watch the eruption! I loved watching Kaitlyn explain how all the bubbles pushing against each other makes everything go “splush!” and that’s why it overflows. 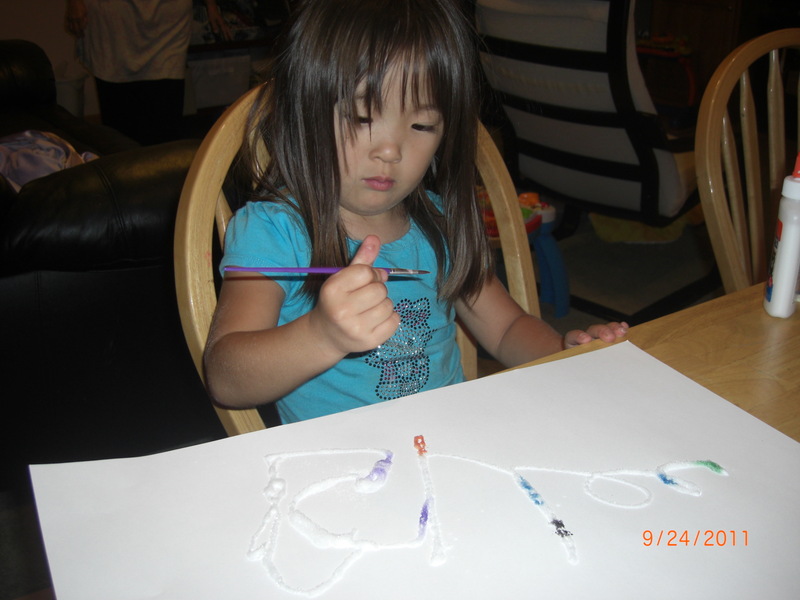 She enjoyed this so much we did it three times with three different colors and she started mixing them together to see what colors that would make. Here’s the blue with the purple. 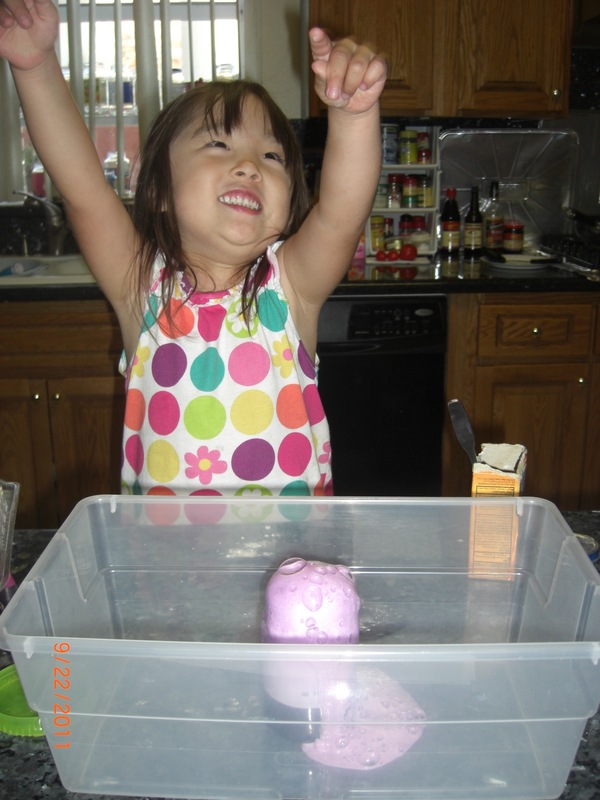 My daughter has been having a blast with these little experiments we started doing. 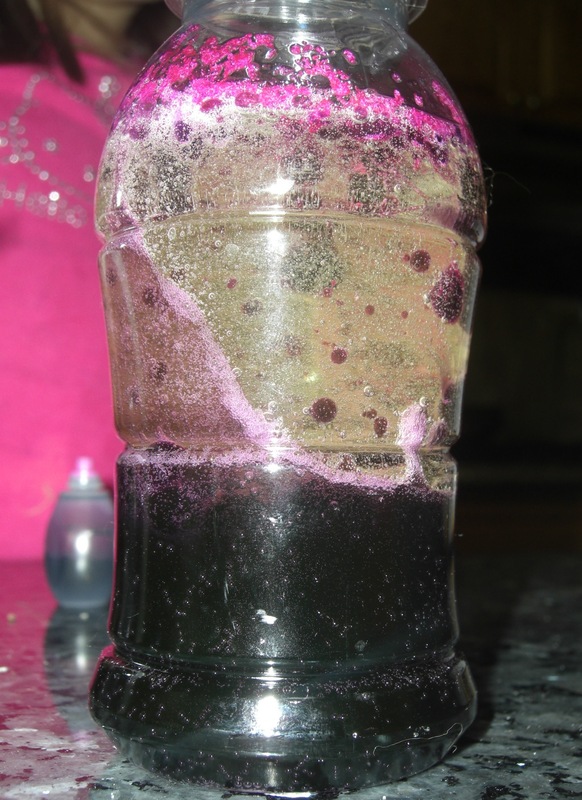 Today we tried the make your own “lava lamp” activity I found on Pinterest of course. It was posted S.L. Smith Photography’s site. 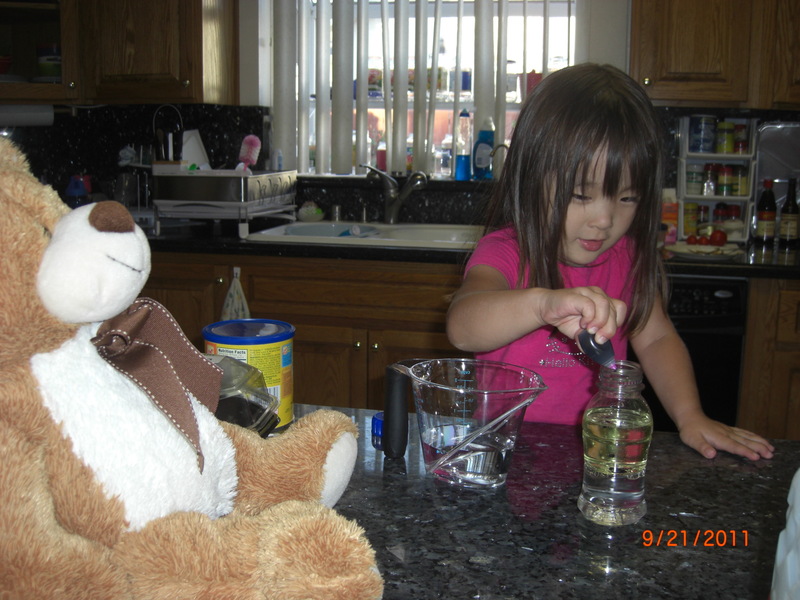 Kaitlyn insisted her bear had to watch the experiment too. Here they are adding the food coloring. 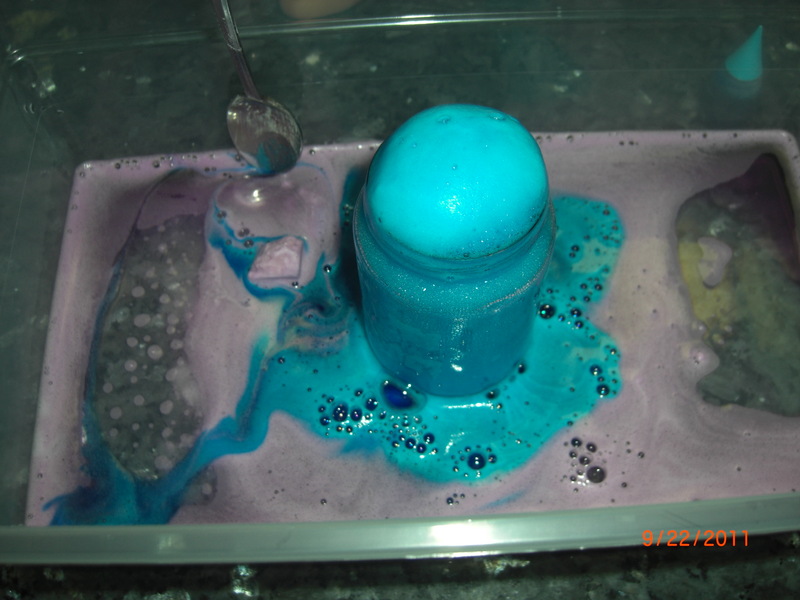 Then we added the alka seltzer tablet piece and voila. I made the mistake of being cheap and not using as much oil as I should have so we didn’t get as much lava lamp action but she still had fun with it. Of course it just got better in her opinion when she dropped a larger piece in and it fizzed up and overflowed like a volcano. She had a great time and went through four alka seltzer tablets. It’s nice because I have no clue who bought them but they have been sitting in our closet for awhile now. Cheap Toy Story 3 Operation & Monopoly Deal Games! 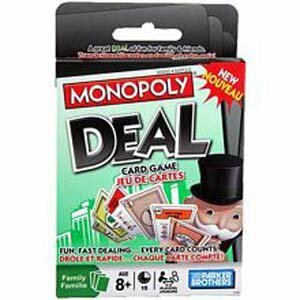 If you live near a Big Lots and a Walmart or Target you can score some really great deals on the Toy Story 3 Operation and Monopoly Deal games. 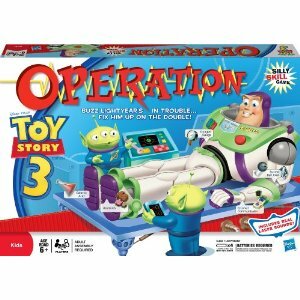 Big Lots has the Toy Story 3 Operation game on sale for $5. They don’t accept coupons but you can take the ad in and price match it at Walmart or Target plus use the $4/1 Operation game coupon that was in the Sunday paper a few weeks ago or the printable coupon here. I did this at Target and was surprised that they gave me no problems about doing the price match at customer service. While there I also picked up the Monopoly Deal game because my nephew loved playing it with his uncle so I thought he might like his own set. Target has it for $5.24 and there is also a $4/1 coupon that works on it. Woohoo! So if you know of anyone who enjoys these games it’s a great time to go pick one up as a gift. I was browsing the Dollar Spot at Target while my mom returned some things and I saw a small section with a 50% off brown dot items sign. It was pretty picked over but I found two workbooks I thought my daughter would enjoy. Lately she’s been into addition and subtraction and naming off the continents. 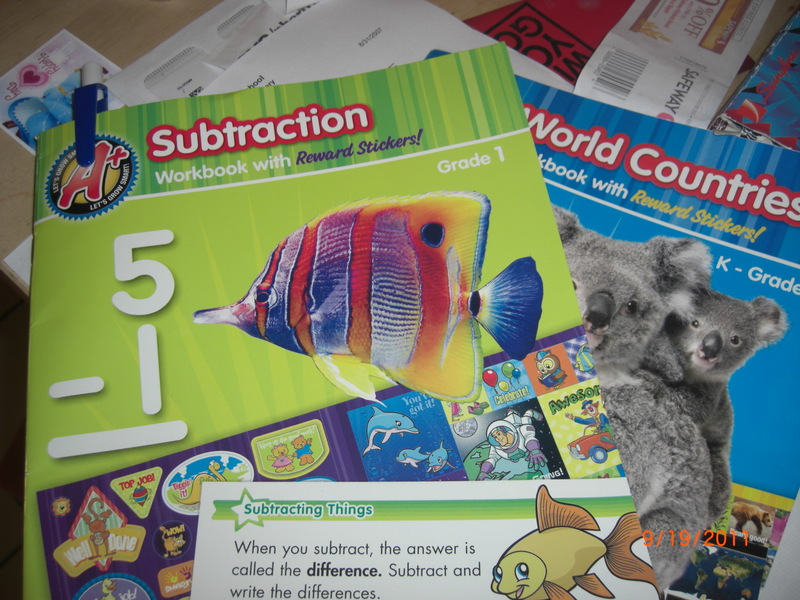 So I picked up one subtraction book and one about the world. When I checked out I was surprised to find out both only cost $.65 all together after tax. Turns out the brown dot items were 70% off but they didn’t change the sign. So not bad if I do say so myself. 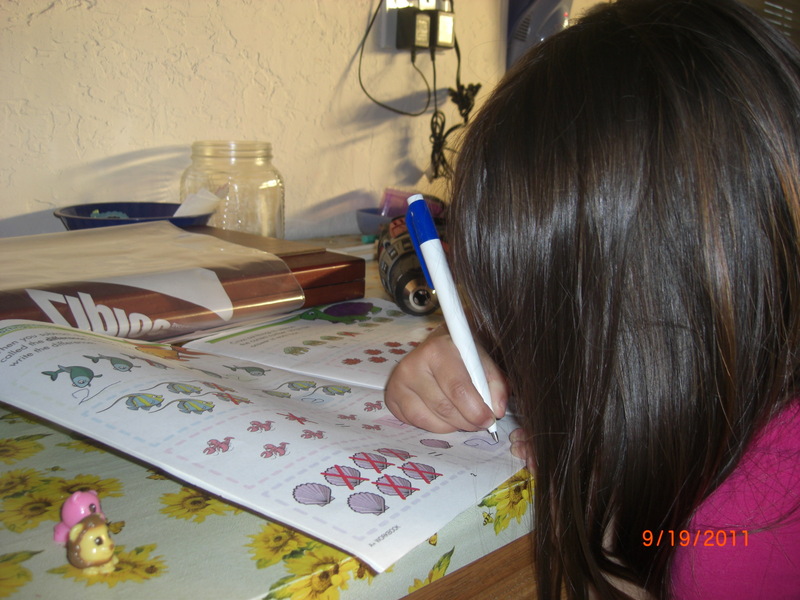 My daughter couldn’t wait to start on them and starting working on the subtraction activities on the way home. 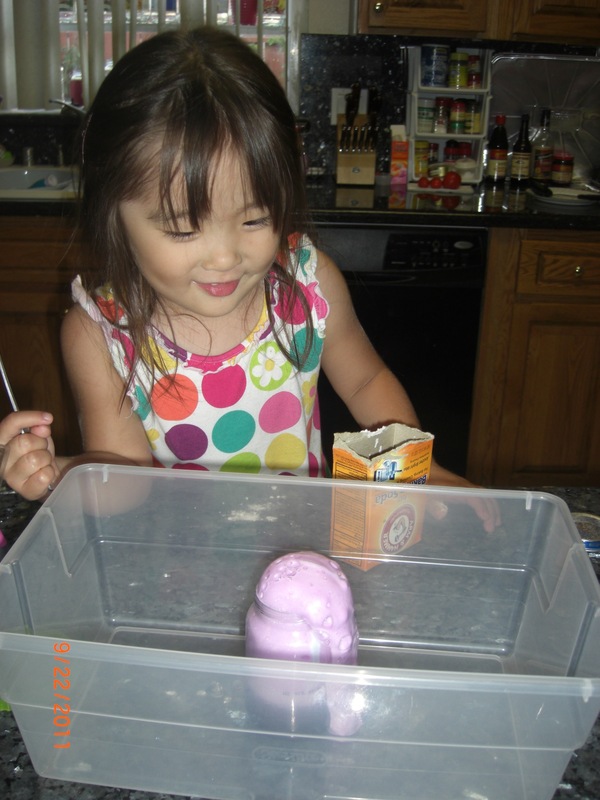 Today she wanted to work on it some more so we decided to add a little more fun by using the squinkies she got as a birthday gift to help figure out the answers. After we finished two pages on a whim I decided to ask her about addition and was shocked she already picked up the pattern of what 1+1, 1+2, etc was and could add them up until I stopped at 1+9=10. I asked her if she wanted to try her 2s (i.e. 2+1, 2+2…) but she was done so I didn’t push it. So if you want to pick up some cheap workbooks go check out your Target. I think that even beats printing out the free worksheets you find online after you add in paper and ink price. I let my daughter pick out a big on our last trip to Half Price Books and she chose this one. It was published back in 1994 by Random House for Young Readers so being an oldie I’ve never heard of it. I was shocked that even not having read it before and thus not having it memorized she browsed through it the entire ride to the shopping center and the entire time I was shopping in Kohls. If anyone has ever taken a 4 year old shopping you know it’s hard to keep the whining in check so I was amazed. She just loved looking at the pictures and guessing what was going on. When bed time rolled around I finally read it to her and it was the cutest book. If you are working on rhyming with your child this is a great story. 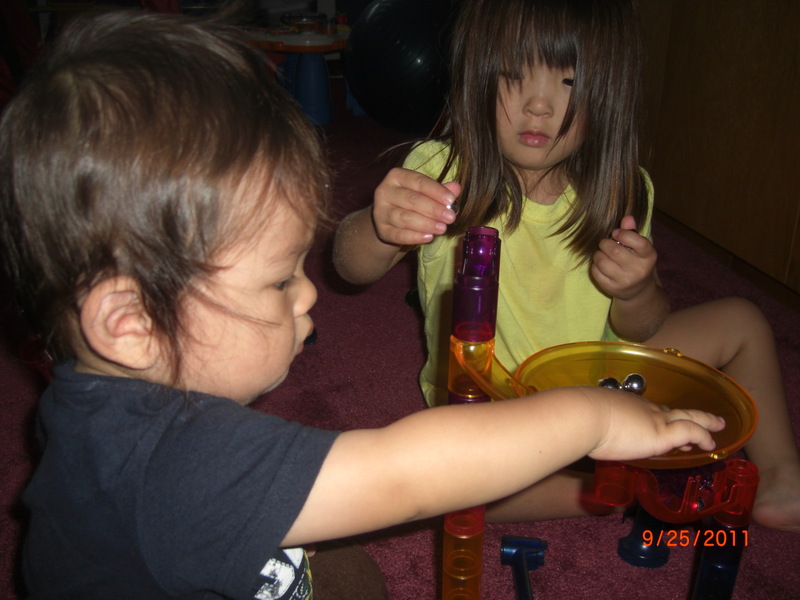 It has a nice rhythm and repetition that it makes it easy for the kids to follow. My daughter has been hooked on this site words video and knows a few words here and there but now she easily recognizes “it” and can spell it so she loves “reading” the book to me. The story itself is also fun. 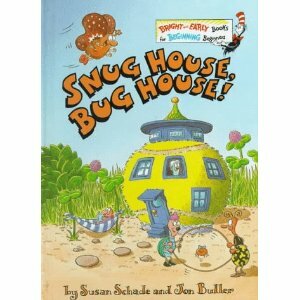 It’s about a group of bugs that find a tennis ball, think up a plan to turn it into a house and then follows them as they build the house. The illustrations are adorable and humorous and I will admit this is one of my favorites to read to my daughter at night. I think I recall having some old tennis balls that don’t bounce any more. 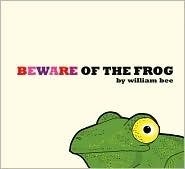 Hopefully if I haven’t thrown them out I was thinking of trying out an activity with K in relation to this book. I plan on letting her paint or draw windows, doors, etc on the ball and glue some leaves or grass for the roof like they did in the book. I’m going to let her decide how she wants to decorate it so we will see how that turns out.